​California Labor Law Posters - Employers are required by the US Department of Labor and also by the State of California Government. Guarantee your Business to be fully compliant for your mandatory labor law posters for 2019. 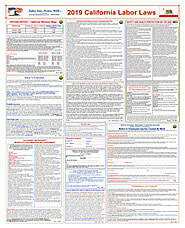 California Labor Law Update Notification Service: Once you have purchased a ( poster set ). Your company will be entitled to this service at no cost. You will be notified via email of any Federal or State Postings that change / update during this year. ► ​​​January 1, 2019 - California Minimum Wage $12.00 & $11.00 Shipping Today !!! 1. California 2019 Minimum Wage - ( 1 / 2019 ) Update Shipping Today !!! 11. 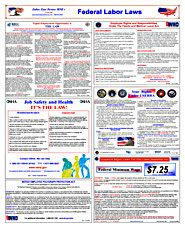 Notice of Workers' Comp Carrier - Poster must be (obtained from the employer's workers' compensation insurance carrier). 14. No Smoking - (not on poster) - can be purchased from any hardware store.